Lots of progress made in two days, and what was most exciting was that the impact plants I’d selected were delivered. In the plan my designer had placed 5 plants at various intersections of the path, punctuation points so to speak, as well as a large ‘something’ to give some seclusion to the reading area. We visited her wholesaler in the weeks before work began to select what the items would be – I had a completely open mind; we thought evergreens, as my garden lacked these – maybe some sort of conifer for the 5 points, but much depended on what was in stock, and looking good. Spring in a plant wholesaler is like a visit to the garden centre only more so – because the shrubs and trees are in all sizes almost from acorn to mighty oak (and prices to match) so if you want an instant garden you can buy it. It was wonderful! Fresh in from Italy, and catching my eye immediately were some box (Buxus) spirals, and once I’d seen them my mind was made up, no need to look at anything else. We put five to one side. Plans for a larger evergreen went by the wayside when we saw some large multi-stemmed Crab Apples (Malus) about to burst into blossom – my specimen plants were selected! 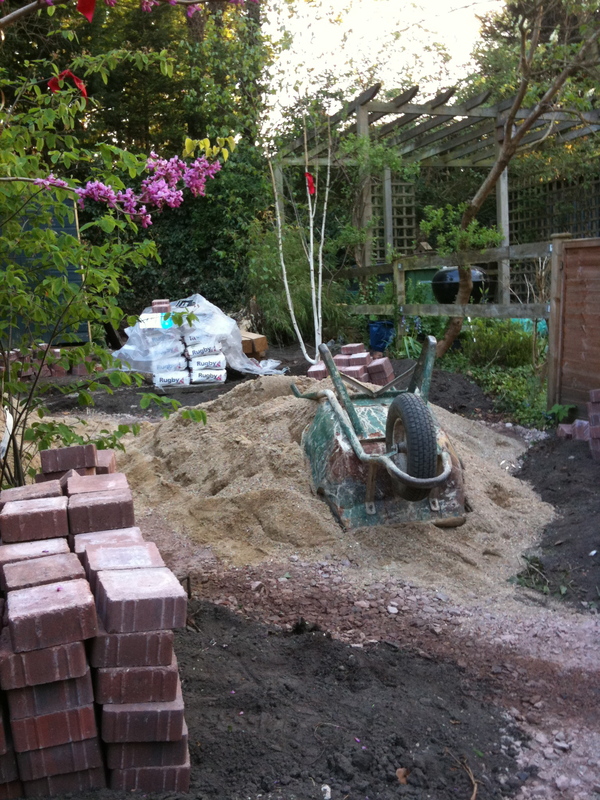 Also over the course of the two days the building materials were delivered – bricks, sand, oak posts, railway sleepers, more bricks and more sand. The scalpings (stone chips) that would provide the foundation for the path and the sitting areas were laid, the plan was really coming to life. 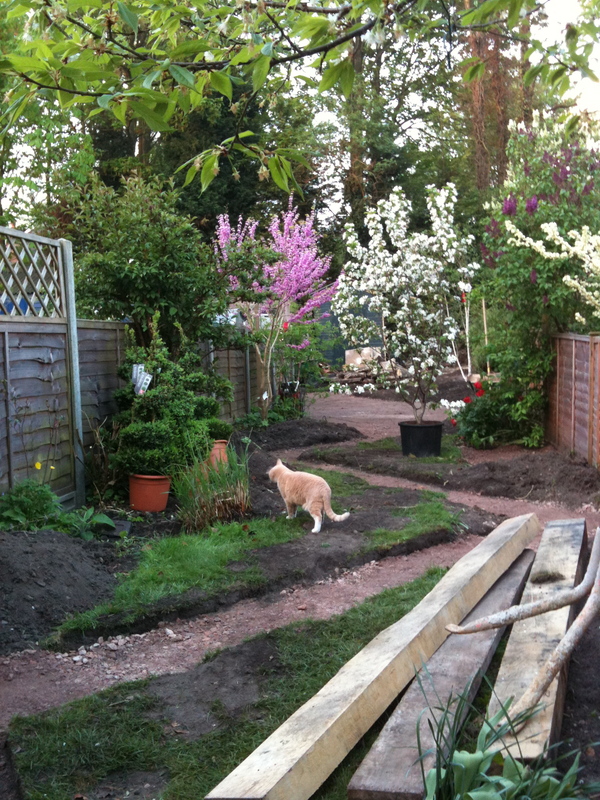 The two images show my box trees and the crab apple (white blossom) and just some of the building materials. This entry was posted in Creating my garden, In my garden and tagged gardening, landscaping, specimen plants, transformation. Bookmark the permalink.